In our last couple of posts, we saw haw crude saltpeter was produced in various parts of India. In today's post, we will study the process of refinement that was undertaken there. Crude saltpeter produced by using artificial heat sources for evaporation is generally more pure than that produced using solar energy for evaporation. This is because when artificial heat is employed, some impurities can be removed by skimming off the scum that floats to the top of the liquid when boiling it, and other impurities precipitate at the bottom of the vessel when the concentrated brine is allowed to settle and can be removed by passing the liquid through a fine cloth filter. By contrast, when the heat from the sun is used to evaporate the liquid, nearly everything that can crystallize is collected together, which includes many impurities as well. Crude saltpeter produced by the processes detailed in our last two posts had a wide variety of purity. 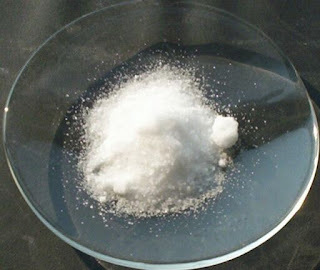 An analysis printed in the Agricultural Ledger of India (Volume 12) in 1905 of 55 samples of crude saltpeter from different parts of India, showed that the potassium nitrate content varied from as low as 26.8% to as high as 80%, with the average percentage predominantly at around 53%. The chief impurity in all the crude saltpeter samples was common salt (a.k.a. sodium chloride or NaCl). Some samples from Bihar showed a bit of sodium sulfate and many of the inferior samples contained quantities of dirt and other insoluble substances. Because of the impurities present in it, crude saltpeter is yellowish in color, instead of white. A pure saltpeter sample. Click on the image to enlarge. Public domain image. An experienced person can determine fairly accurately, the amount of potassium nitrate in a crude saltpeter sample, just by looking at it, since potassium nitrate crystals are small elongated prisms, whereas common salt (sodium chloride) crystals are shaped as cubes. David Hooper, in his notes about Indian saltpeter production in 1905, mentions that he witnessed an an expert dealer, a Mahajan from Kanpur, purchasing some crude saltpeter and declaring that it was of superior quality and paying an appropriate price for it. When a sample of his purchase was later chemically analyzed, it turned out that the expert dealer was pretty accurate on his estimate of how much potassium nitrate was in it (the lab test showed 67.73%). He also mentioned that the prices of crude saltpeter tend to vary depending on the season and their cheapest price is just before the rains, because the crude saltpeter produced at this time is of inferior quality, owing to the conditions of temperatures under which it is produced. This is also the time that the refiners would buy extensively, because crude saltpeter could not be made during the rainy season. In a saltpeter refinery, the process was similar to that carried out by the nuniahs to extract crude saltpeter, as was described a couple of posts ago. They would use nitrated earth, which was worked over and over again, with weak liquors being thrown on to it. However, after the strong liquors were collected from the filters, they were not evaporated by themselves. Instead, additional crude saltpeter crystals (which were largely bought from the nuniahs) were dissolved into the liquid at boiling point. Potassium nitrate dissolves differently in water at different temperatures, whereas sodium chloride (the primary impurity) dissolves at a constant solubility. This means that at lower temperatures, potassium nitrate doesn't dissolve in water that much, but at higher temperatures, potassium nitrate has great solubility in water and sodium chloride has much lesser solubility. Therefore, at boiling point, the potassium nitrate dissolves into a saturated solution, whereas most of the sodium chloride crystals remain undissolved, along with other impurities (dirt, minerals etc.) that don't dissolve in water. Then, it can be filtered and allowed to settle and cool down, to deposit more purer crystals, which can then be washed in cold water to clean them (which dissolves some of the potassium nitrate, but not all, and the cold water can be recycled to extract the nitrates). The resulting crystals are about 95% pure potassium nitrate. In our next post, we will look at a more detailed description of the refinement process, with sketches of a typical factory.